Doorway jumpers have been around for a long time, but their purpose has remained the same since their invention; they are a great way for baby to get exercise, see the world around them from an upright position, and work on their muscle development. There are a lot of different doorway jumpers on the market and choosing one can feel like quite a challenge. We have brought you three of the best doorway jumpers on the market after doing extensive research and comparing the top 20 doorway jumpers against each other. These three models won hands down for performance, safety features, style and reputation. They all have the same basic set up which is a seat that is suspended from a clamp with sturdy and durable suspension straps. Using the doorway jumper on a regular basis will help your baby sleep better and release more energy so at bedtime, they are ready to go. They are great items to get for new parents although if they are new, maybe put a list of safety tips regarding the doorway jumper in their gift. They will really appreciate it. Your baby is going to love the doorway jumper and you will love listening to them laugh and giggle as they use it. Graco’s Bumper Jumper is a fun and engaging doorway jumper that your little one will love. The high back nylon seat can be taken off and washed in the washer with no problems so it stays clean. There is a soft all around bumper to protect the woodwork if the baby bumps into it or scrapes against it while jumping. The non twist straps and plastic dome that keeps the straps from twisting and getting tangled make jumping fun but it also makes is super easy to get your baby into and out of the doorway jumper. Safety is always a top priority with parents, so users will be happy to hear about the sturdy spring that has the hidden safety cord. This makes it very safe for your little one. The no-mark clamp that holds the jumper onto the frame will not mark up your doorways at home or when you are away traveling. The spring loaded clamp won’t mess up your molding either. This no mark clamp means you can put the doorway jumper anywhere and not have to worry. This doorway jumper that easily attaches to any doorway with a doorframe grows along with your baby. They can use it from 5 ½ pounds up to 25 pounds. Your child needs to be able to securely hold their own head up before they can safely use this doorway jumper. All you need to do is adjust the height to accommodate the child’s legs as they get bigger and they have a jumper that they csn use for awhile. 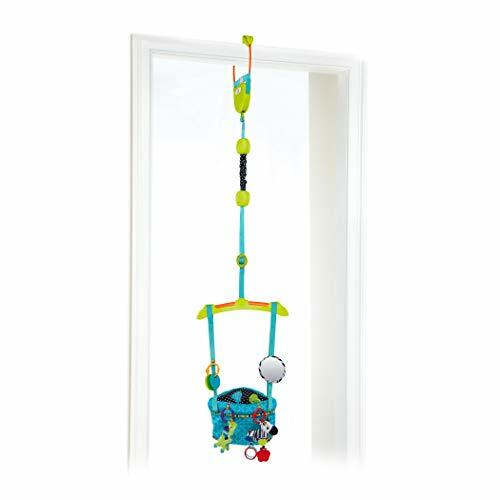 Add even more fun to this doorway jumper with the toy tray that comes with two soft, removable interactive toys that can adjust to the adjustable tray. The cute jungle theme will be very sweet for your little one, whether they are a girl or a boy. They will love the giraffes, elephants, monkeys and other little safari animals. Evenflo Exersaucer Door Jumper fits all standard doorways that are 3” to 6” thick that have firmly secure door trim that is at least ½” wide. The framed seat surrounds the child on all sides so they can’t bump into the doorframe and hurt themselves. The fully enclosed spring prevents finger pinches so parents can rest easy that their baby’s little fingers won’t be hurt while they are jumping and having fun. The enclosed spring also prevents dust and dirt from getting into the spring and causing it to not jump properly. The adjustable straps allow you to change the jumper to accommodate the baby’s changing height and weight. The doorway jumper from Evenflo packs up fast and easy, so it is the perfect jumper to take on trips to visit the grandparents or even on vacation. The sturdy doorframe clamp keeps the doorway jumper in place safely and as long as parents follow the specifications of a dedicated door trim, there is no worry that the door clamp won’t work properly. When the baby is done jumping, just take them out and wipe down with a rag and allow drying before putting it away. It is the perfect baby item for letting your child exercise and have fun in a supervised setting. The locking clip at the top of the doorway jumper holds the Sassy Seat Doorway Jumper to the top of the door frame securely. The durable spring allows baby to jump securely and safely. The machine washable seat allows parents to keep the jumper clean easily. There are five different developmental toys that go along with this doorway jumper. They clip onto the seat and also onto the side hanging mechanism so your baby is entertained even when they don’t feel like jumping. The neutral blues and greens work for boys or girls and gives your baby a safe place to exercise their leg muscles and see the world from a different vantage point. The locking mechanism is not something that all doorway jumpers have, so this adds another level of added security when your baby is in the jumper. Doorway jumpers were actually the first jumpers that were available for babies. For awhile they were considered potential hazards but with the proper education on using the, properly and as long as the baby is within the weight range, these fun toys can provide all kinds of entertainment and fun for your baby. All three of the doorway jumpers that have been reviewed above are customer favorites due to their reputable brand names that are known for high quality products, for their design, safety features and performance. Keep reading below to learn even more about doorway jumpers and how to choose just the right one for your child or the child of a loved one that you are buying a gift for. This buyer’s guide provides you with the information you need to make a confident decision on just the right doorway jumper for your baby. What is a Doorway Jumper? A doorway jumper is a popular piece of baby gear that attaches to an interior doorframe at the top, usually by a heavy duty clamp that allows babies to jump and bounce in. It is a great way for the baby to build up those leg muscles in a fun way that they will really enjoy. Doorway jumpers also play a part in helping neurological growth. It also helps with their developing balance and awareness of the world around them. Finding good, safe ways to help your baby develop their muscles is important as your baby grows. The baby jumper is a great way for them to be in an upright position with their feet on the floor where they will naturally press to try and stand. Once they figure out they can bounce, you will see your baby having all kinds of fun as they discover just what their little legs can do. Studies have shown that babies sleep much better when they are tired and the doorway jumper is a great way to wear them out and help them have a terrific night’s sleep. There are a few other names that you may hear doorway jumpers called including Johnny Jump Up, Jumperoo and an Exersaucer. You should not put your baby in a doorway jumper until they can support their heads without help. If the doorway jumper you are interested in has definite age and/or weight requirements, you need to follow those for your baby’s safety. Jumpers, Bouncers and Swings – What’s the Difference? We have described the differences between doorway jumpers, baby bouncers and swings below. Many times these items are confused, especially for a new parent. It’s actually very simple to tell the difference once you know what each does. 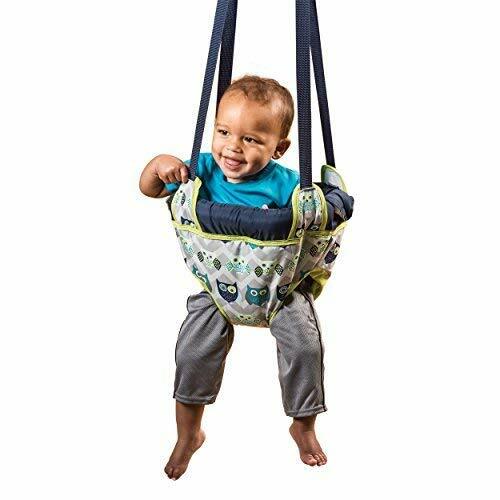 Baby Swing – swings either front to back or side to side without the aid of your baby. Baby swings can be used from birth to about 25-30 pounds depending on the manufacturer. Modern day swings have lights, music, toys and multiple speeds available these days making them one of a parents favorite baby items. Baby Bouncer – A baby bouncer is an angled seat that you strap your baby into. They can have music, vibration features and toys. They move according to the baby’s movements although there are some automatic bouncers that will gently bounce automatically with the flip of a switch. Baby Jumpers – Jumpers are clamper in doorways with a strong, secure clamp and the baby sits in them with their feet touching the floor. They can bounce and jump in these devices, and usually have a grand time doing it. There are many different features that a doorway jumper may have. When you start looking for the right doorway jumper for your baby, be sure to look for these features. Weight – Look for doorway jumpers that have a good weight range; up to 25-30 pounds at least. Seats – Make sure that the seats are lined with plenty of extra padding for comfort but ensure that the seat covers are removable and machine washable. Another great seat feature is being adjustable so as the baby grows, the doorway jumper can grow with it. Suspension – do not get the doorway jumpers that only have one elastic suspension strap. This style tends to swing too much, bumping the baby into the door frames. At least two suspension straps are good, more is better. They keep the bouncer balanced and your baby can jump in peace. Make sure that the suspension straps are padded and covered to avoid any problems with pinched fingers. Adjustable – Some jumpers are only height adjustable while others will adjust for weight too. If you invest in a doorway jumper that is fully adjustable, your baby will be able to use it even as they grow and get bigger. When the doorway jumper is the right height, your baby will be able to touch the floor with their toes or a little more. Easy Storage or Travel – Most jumpers are very easy to move from doorway to doorway which makes them the perfect item to bring along when you go on vacation or visit relatives. They are also easily stored and fold up easily and safely. Toys – While toys are not a necessity, it’s always nice for your baby to be able to entertain themselves if they don’t feel like jumping the whole time. Almost all doorway jumpers have at least one of more clip-on toys that the baby can touch and play with. Don’t attach toys to the jumper yourself unless they are integrated into the existing system for the safety of your baby. How safe your doorway jumper is, is entirely up to the parent. There are important safety guidelines that are good to abide by and that will keep your baby safe and sound during use. Only have your baby in the doorway jumper for 15 minutes a time. They should get floor time as well. Once your baby reaches the age of walking, they should not be placed in the doorway jumper any longer. The usual age is 4 months to walking age. Doorway jumpers can come in a variety of models that can meet the growing needs of your baby. Below are some of the more common styles. Character styles that are made into the form of cars, animals, cartoon characters and more. Some models have soft activity mats that are placed directly under the baby’s feet. Some mats can double as storage bags and keep the baby’s feet off of cold floors. Doorway Jumpers are the perfect way for your baby to gain muscle tone and exercise their little legs and feet in a safe, controlled way. They are great for ages ¾ months up to walking age. Babies love to watch what goes on around them, so this doorway jumper is a way for them to sit upright and take their new world in and jump too. The information that is contained in this buyer’s guide is designed to help parents choose the right doorway jumper for their baby. There are also features information and safety tips as well. This information will help consumers sort through all of the choices of doorway jumpers on the market and make a decision that will be perfect for their baby and their home.